2012 sales of American Eagle Silver Bullion Coins stopped at 33,742,500, the third highest annual total in the 27-year history of the series. No more of the one-ounce, 99.9% pure silver coins this year will get sold by the United States Mint. 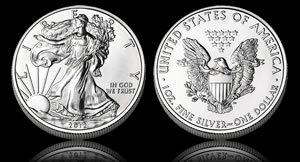 Specifically, the U.S. Mint told its distributors that it has "sold all remaining inventories of 2012 American Eagle Silver Bullion Coins," adding that "no additonal coins will be struck." This year’s American Eagle Silver Bullion Coins launched on January 3, 2012 along with 2012-dated American Eagle Gold Bullion Coins. Both sets of coins came off a very robust November where Gold Eagles more than tripled and Silver Eagles at 3,159,500 more than doubled sales from November 2011. Sales in December for the silver bullion coins will stay at 1,635,000. Until the sellout, Silver Eagles were easily pacing toward the second-best annual sales slot. 2010 will now hold that place with annual sales of 34,662,500. The all-time highest sales year happened in 2011 with an annual total of 39,868,500. Sales of the American Eagle will continue on January 7, 2013 when the U.S. Mint begins accepting orders for the 2013-dated issues. That leaves a three-week window of unavailability for the Mint’s most popular product. Pent-up demand and newly dated coins will ignite sales in January, an always strong month for bullion coins. The all-time monthly record for the American Eagle silver series was in January 2010 when sales reached 6,422,000 bullion coins. The second best month on the books is January 2011 with sales of 6,107,000. U.S. Mint bullion coins are not sold directly to the public but instead to a group of distributors dubbed "Authorized Purchasers." AP’s purchase bullion coins from the U.S. Mint in volume for a modest amount over coin melt values and then resell them in smaller quantities to bullion and coin dealers or directly to the public.